The cancer of corruption eating into India’s medical sector is no secret. Reports of patients being prescribed unnecessary tests by unscrupulous doctors in league with labs abound. Alongside there are frequent reports of needless procedures — from caesarean births to the insertion of stents into healthy hearts and replacement of workable knees — thrust upon patients by doctors keen to make a killing off someone’s unease. Such practices seriously harm the health and finances of Indian patients. In addition such malpractices are gaining India’s medical tourism industry — once tipped to hit six billion dollars by 2018 — infamy around the world. Transparency International ranks India’s medical industry as the second most corrupt institution citizens encounter following the police. This image, of a corrupt, cynical trade preying on patients, is seriously damaging medical tourism to India. Already hit by tight visa rules, a decaying ethical reputation could see India — visited by 350,000-plus overseas patients in 2012 — beaten flat by better-reputed destinations like Singapore, which saw over 600,000 overseas patients. 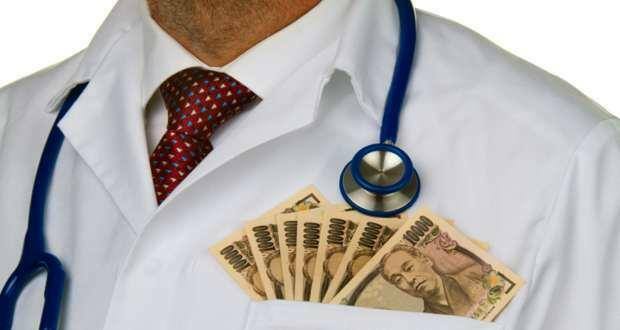 There are strong global practices and precedents to control medical corruption. In America, only this year, six hospitals have been fined millions of dollars for improper financial ties with diagnostic centres and recommending needless procedures. That included a Kentucky hospital fined 41 million dollars for prescribing unnecessary coronary stents. In contrast to America’s tough action, India’s response is laughable. Health minister Harsh Vardhan is himself a doctor who admits he’s worried by tests forced on patients by doctor-hospital-lab cartels, a recent sting operation showing eight reputed diagnostic centres involved in an alleged commissions scheme with doctors. Yet, his response has been to turn the matter to the ethics committee of the Medical Council of India — ironically, this body is itself in deep controversy over corruption, making it imperative MCI cleans its own reputation first. For overseeing the medical industry’s practices, India needs a spotless body with professional weight and ethical credibility. If the government is serious about curing Indian medicine’s ills, it should listen to modern groups like The Society for Less Investigative Medicine, founded by AIIMS doctors to counter unnecessary testing. Meanwhile, quick and clear legal procedures for those ripped off by professionals supposed to aid them in their hour of need must be put in place. It is vital government clamps down, through better regulation and serious enforcement of rules, on individuals and institutions who abuse patients.